Tuan Chau (Tuần Châu) Island in Quang Ninh, Vietnam is a great destination for travelers who want to enjoy nature. As a tourist attraction, Tuan Chau Island still keeps its nature. A highlight of the Island is the Tuan Chau beach that is one of the best destinations for tourists to travel thanks to its white sand and clear water. Other hotspots on the Island are Paradise Suites and 1958 Restaurant. 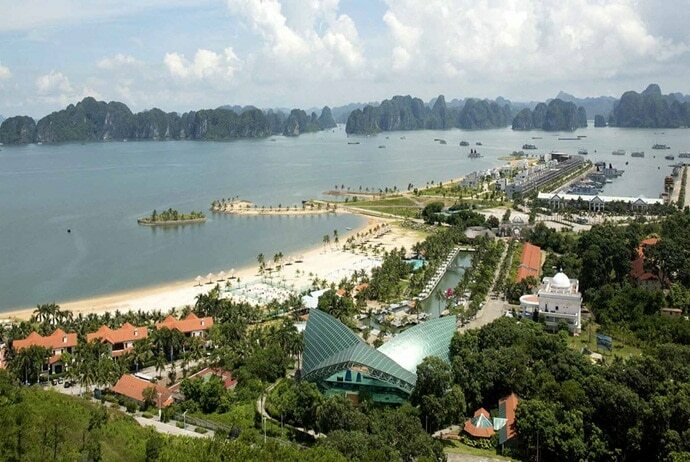 Apart from beautiful beaches and a great view to Ha Long Bay, this Island also has an interesting history. As the Island is located in a special position, the army had an outpost on the island in order to defend Vietnam’s borders. Also, the island has an archaeological history and Ha Long’s culture. 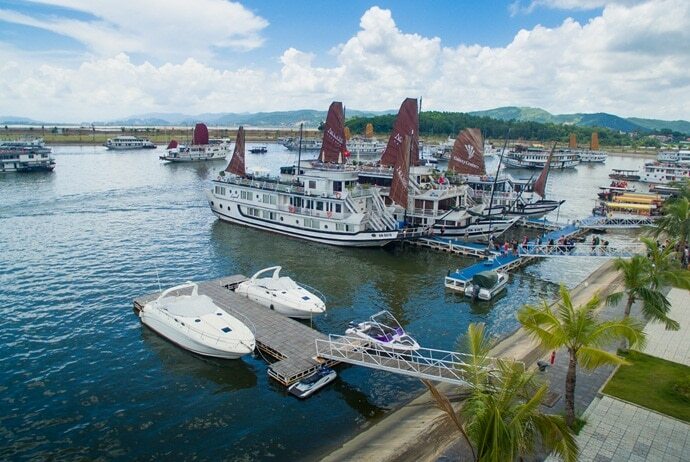 Now is time for tourists to go with Vina.com and discover all necessary things for a great plan to visit Tuan Chau Island in Quang Ninh. Tuan Chau Island is in the north-west of Ha Long Bay and it is about 8 km south-west of Ha Long City. 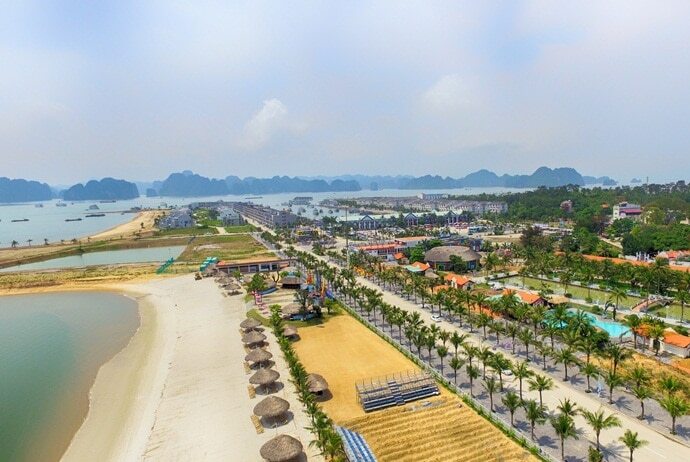 Having an area of 2.2 square kilometers, this island is a new touristic zone outside of Ha Long City, and well- known for its beachside resorts and recreational offerings. To get to the Island, you need to pass through a 1.86-km-long road that connects Ha Long City and the island. Tuan Chau is about 18km away from Highway No. 1. 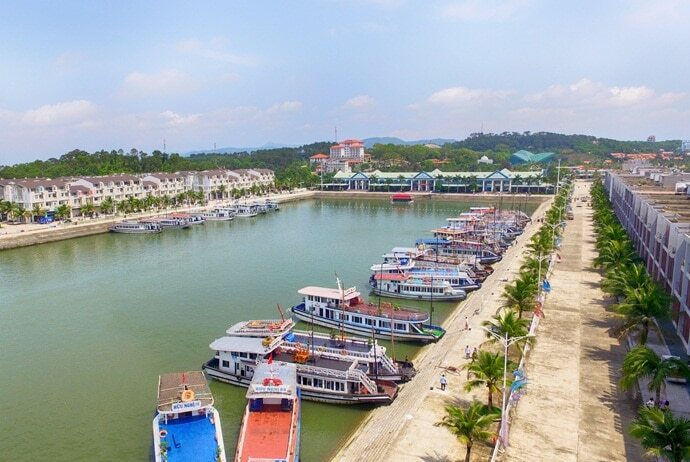 You need about 2 hours to get there by boat from Mong Cai, and about 1 hour from Hai Phong. From Hanoi, you can get to Ha Long City from either My Dinh or Luong Yen bus station. It takes about 4 hours to get there. One of the easiest ways to travel is to use private car, which can be arranged with ease. Taxis and motorbikes are plentiful and ready to transport visitors from Ha Long City and Tuan Chau’s port. Besides, the ferry operates regularly to Cat Ba and Ha Long City. From 2014, there is another way to get to Tuan Chau Island from Hanoi. It is directed flight from Hanoi to Ha Long Bay. The first peak season to visit Tuan Chau Island is from June to July and most of the visitors are from Vietnam and Asia. The second peak season to visit this Island is from December to February, and most of the visitors are from America and Europe. The first off-peak season to this Island runs from April to May and the second off-peak season is from August to October. If you plan to visit Tuan Chau Island during the peak season, you should remember that prices here are often higher at this time. The busiest times are Vietnamese New Year in January or February, Reunification Day (30th April), International Workers’ Day (1st May), Independence Day (2nd September) and Christmas Day. Especially, if you visit Tuan Chau Island in Vietnam on Independence Day, you can experience a red bay with lots of Vietnam flags. Ha Long Carnaval is a special event for travellers, and it is often taken place at the end of April and start of May. The weather varies and has 4 different seasons in Ha Long. Spring is in March & April and it may be the most beautiful season with warm weather. Summer lasts 4 months from May to August and this season is perfect for cruising islands. Fall is in September & October with serene atmosphere. Winter is the four remaining months and it is suitable for travelers who want to experience cooler atmosphere as well as the magical beauty of Ha Long Bay. Tuan Chau’s reputation has been brought by modern times, so you may not know the rich historical background of the island. The Royal Army used Tuan Chau Island as a guard station in order to defend the borderlands. In the late 1950s, President Ho Chi Minh had a vacation with other political leaders on Tuan Chau Island. Now, the house where he stayed becomes a massive mausoleum and is open to the public. It is an important attraction on this island. Up until 1999, Tuan Chau Island in Vietnam was largely undeveloped with no power network and little or even no clean water. Roads were just sandy trails and the fishermen were equipped with basic tools, so they just had a livable income. At this time, Tuan Chau Island did not have direct connection with the mainland until there is a road that connects the highway with Tuan Chau Island. With this connection, there is a new development with a modern tourism hub and an entertainment center on the island. Keep reading this article to know more about Tuan Chau Island in Quang Ninh and then consider visiting this beautiful island as soon as possible. When it comes to learning the basic knowledge of Tuan Chau Island, you should not miss interesting activities in this island. Now, Tuan Chau Island has many recreational activities and markets. And here are some recommended things you should do in Tuan Chau Island. Due to the natural ecosystem’s diversity, enjoying the nature is what you should do. The island is a bit hilly, so some good choices for nature lovers are mountain climbing, camping and trekking. There are two beaches on Tuan Chau Island, stretching over 2km long. They have white smooth sand and clean water. So, if you love swimming, you should not miss these beaches. Tuan Chau hosts many shows with animals such as seals, dolphins, sea lions and crocodiles. The entertainment complex can seat up to 2,000 people. You can also enjoy a high tech water fountain with laser lighting and music as well as film showing on the water screen. Also, there is a martial arts show and a circus that is open from Tuesday to Sunday. The parking is available while taxis are easily seen outside the island’s entrance. If you want to try something new, you can try some water activities such as jet skiing, fishing, windsurfing and boating. 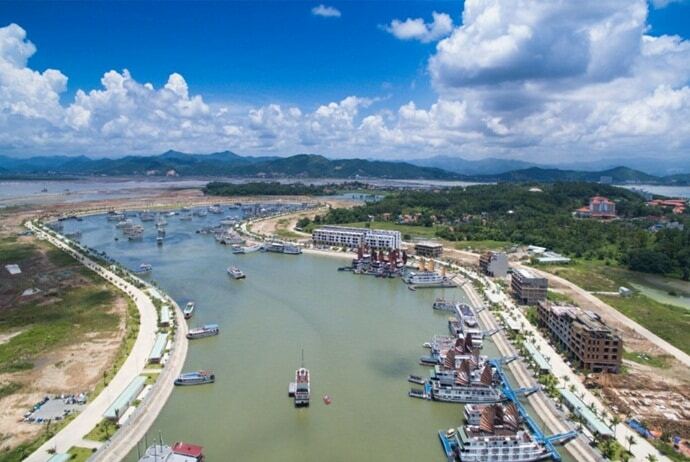 Tuan Chau Island is a new tourism center of Ha Long City, and it is about 8km away from downtown Ha Long. This island has an area of 2.2 square kilometers and consists of many sloping hills. Today, this island is really the most attractive destination of Ha Long City with many constructions for pleasing tourists. Tourists can easily see many international standard villas, streets of foods courts and luxury restaurants that serve up to 1,000 customers. Visiting Tuan Chau Island in Quang Ninh, you do not need to worry about your accommodation because there are many private villas, high-end hotels and luxury resorts with over 400 rooms of international standard. 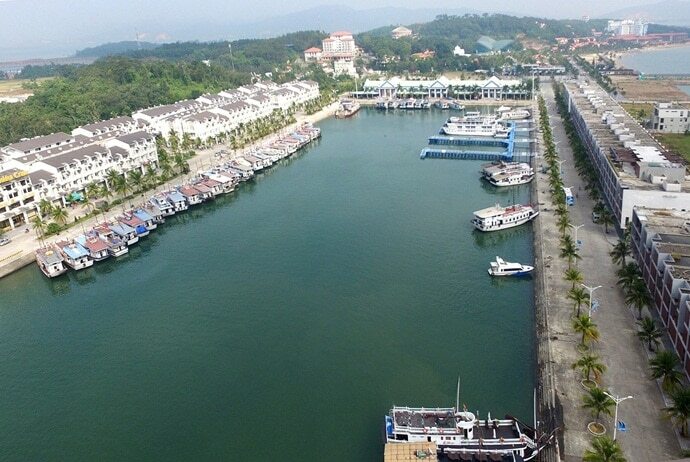 A newly built jetty offering cruises to Ha Long Bay is lined with a man-made beach with local restaurants and cafes. 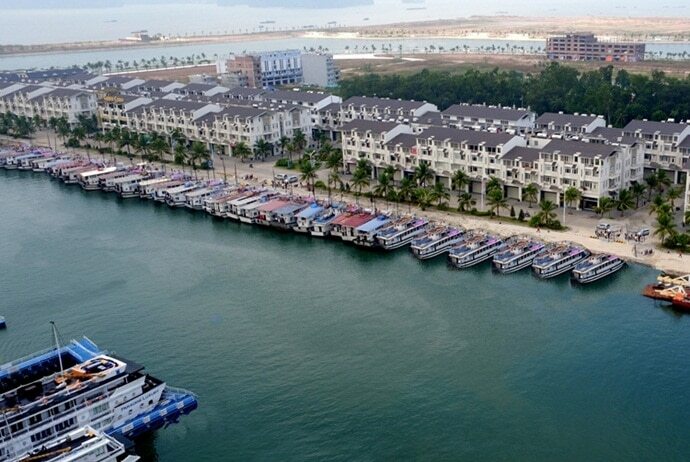 Besides, it also has a large building with cruise counters and modern karaoke club, hence making this island a great destination for locals and tourists. With beautiful landscape, fresh air, blue sea and clean water, Tuan Chau Island is an ideal place for you to discover Ha Long Bay. Therefore, if you have a chance to visit Ha Long City, you should not miss Tuan Chau Island and you will never regret about your decision.